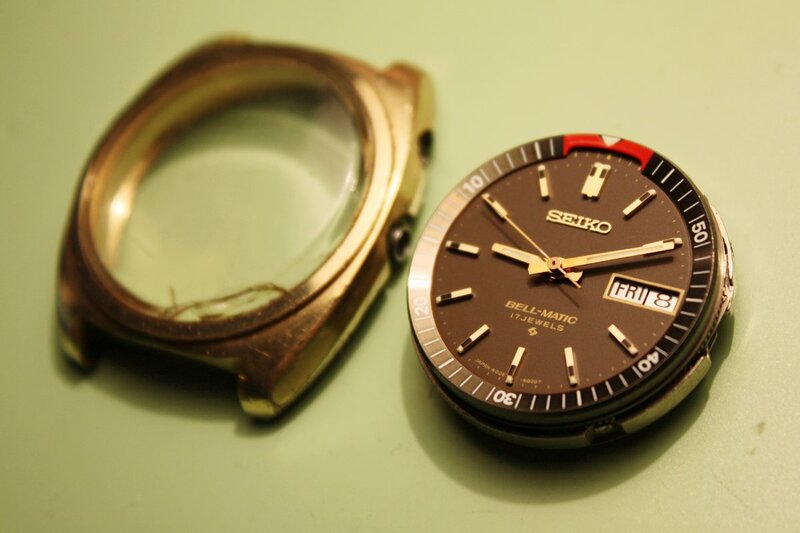 I recently acquired two vintage Seiko Bell-Matics in bad shape. 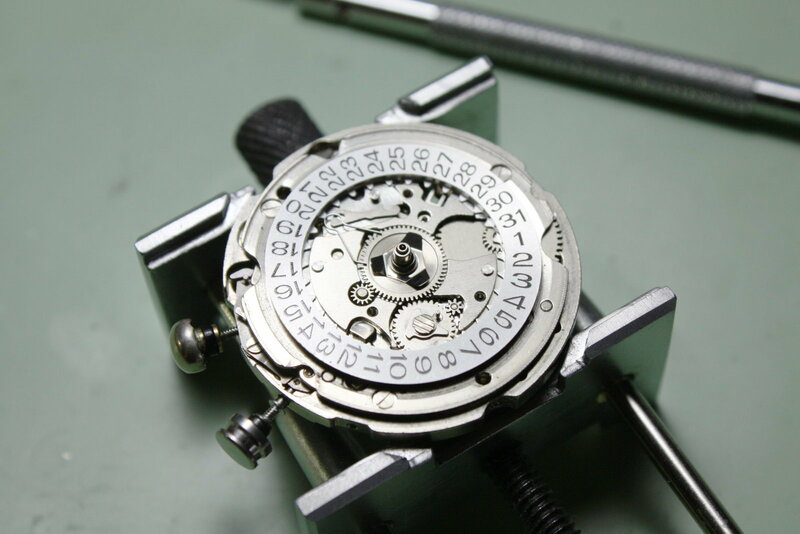 The "bell"-part makes it already clear - these are mechanical wristwatches with alarm function and automatic winding movements. 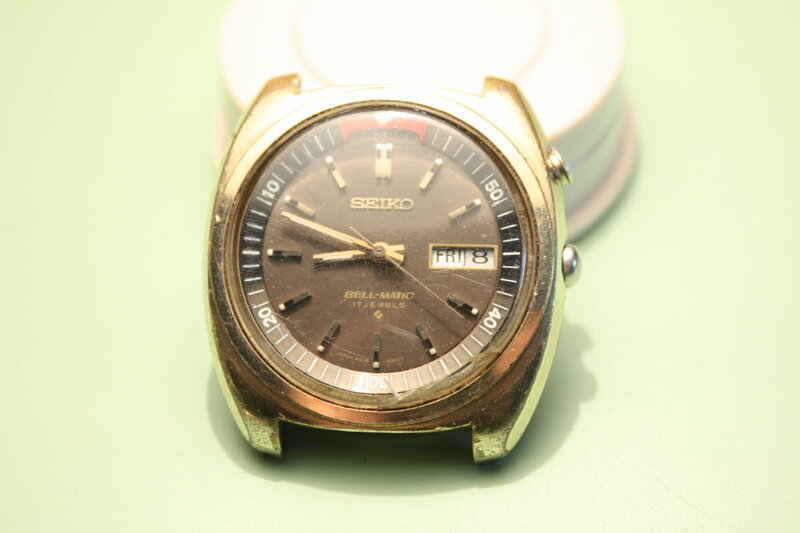 I got this one from ebay because of its presumably great dial and stainless steel case. 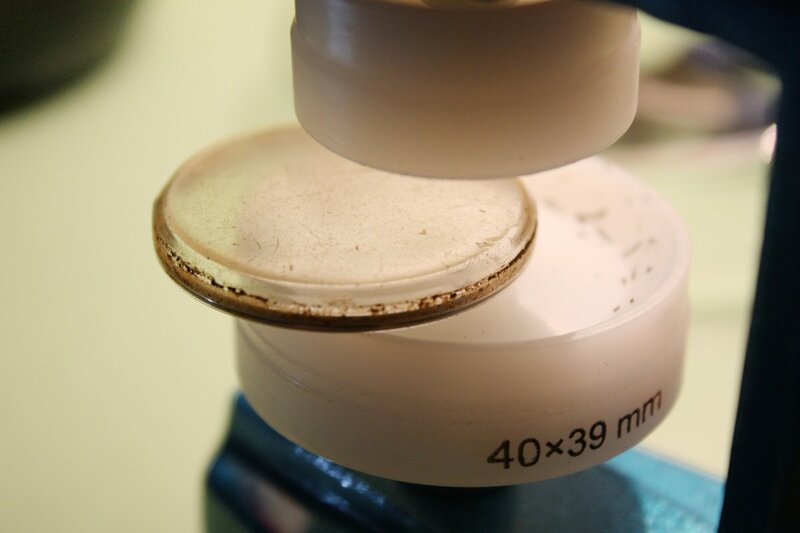 The scratches in the case and crystal should be removable by polishing. 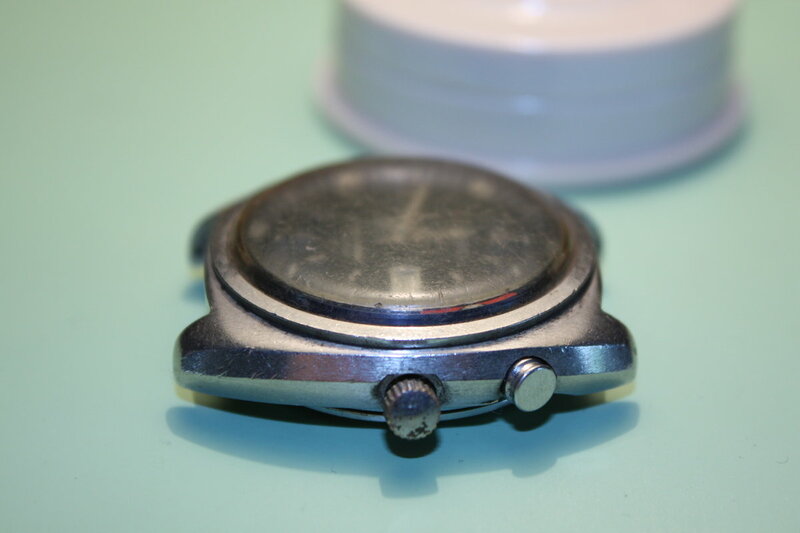 The crown and setting (+ alarm winding) stem seem to be damaged. 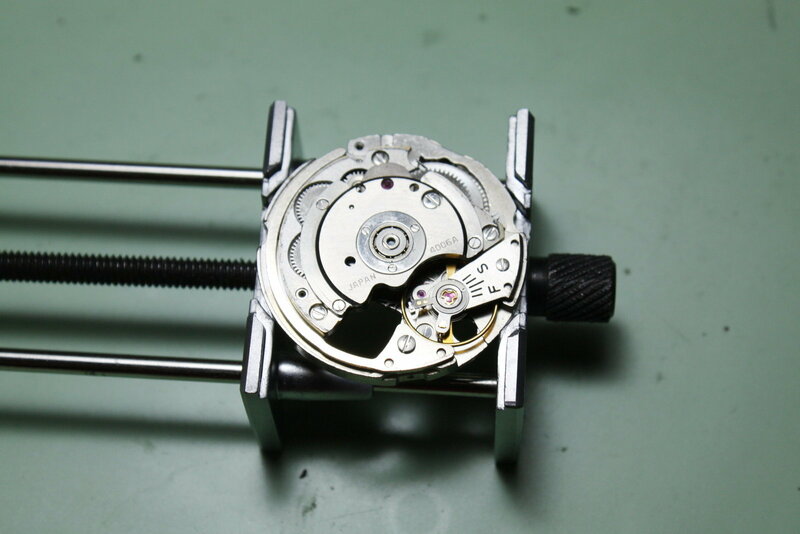 A peek inside - the movement seems to be dirty but quite complete. 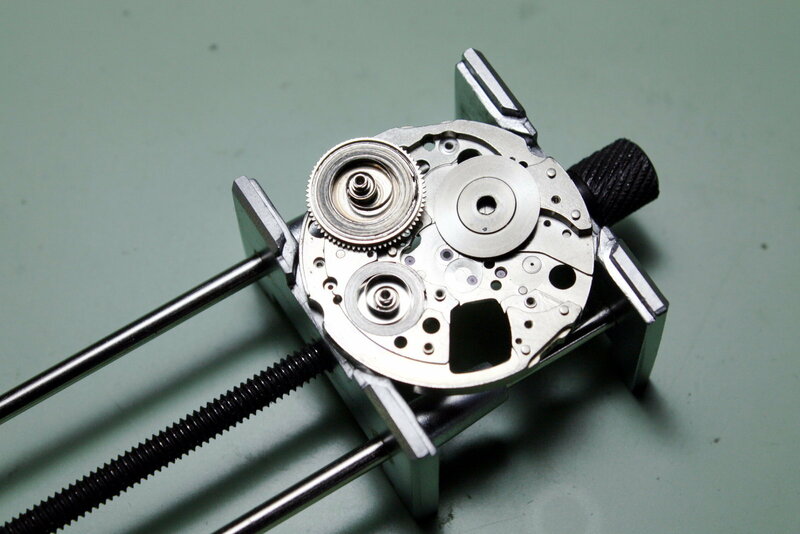 Currently it is in non-working condition and the rotor screw is missing. 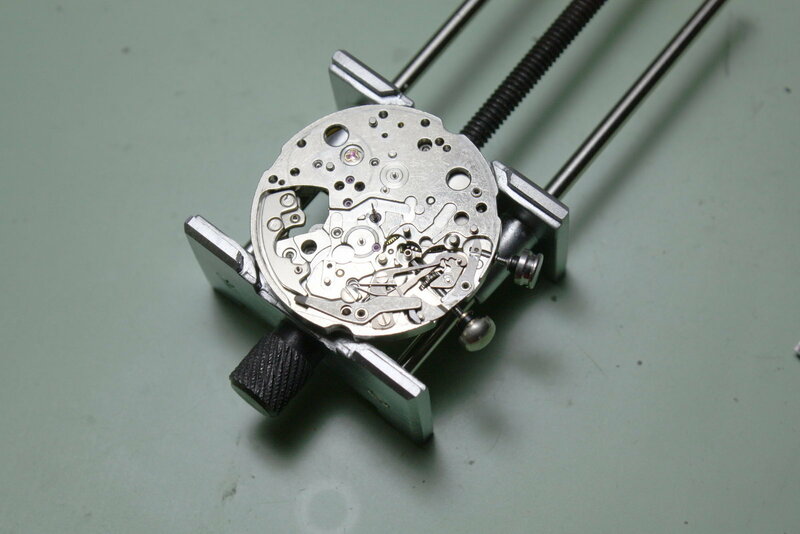 ...but the movement is great and (mostly) working. 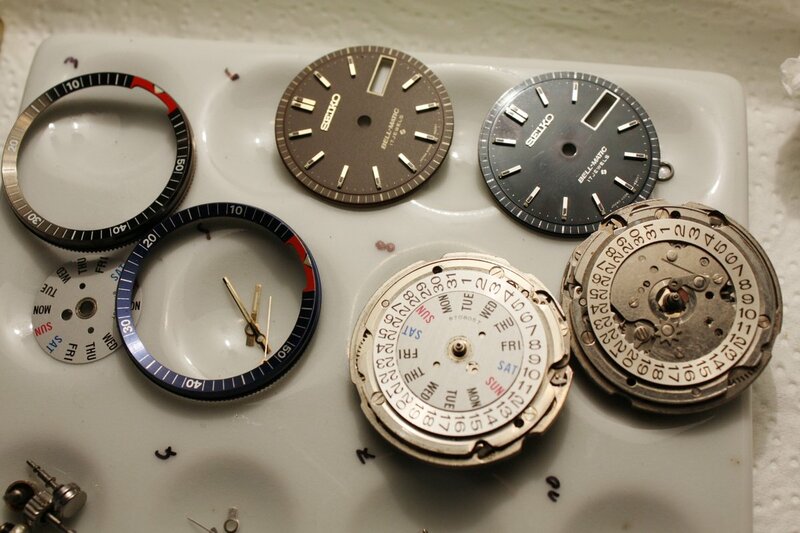 Today I started to get the movements out of both Bell-Matics - I began with the blue-dialed watch. 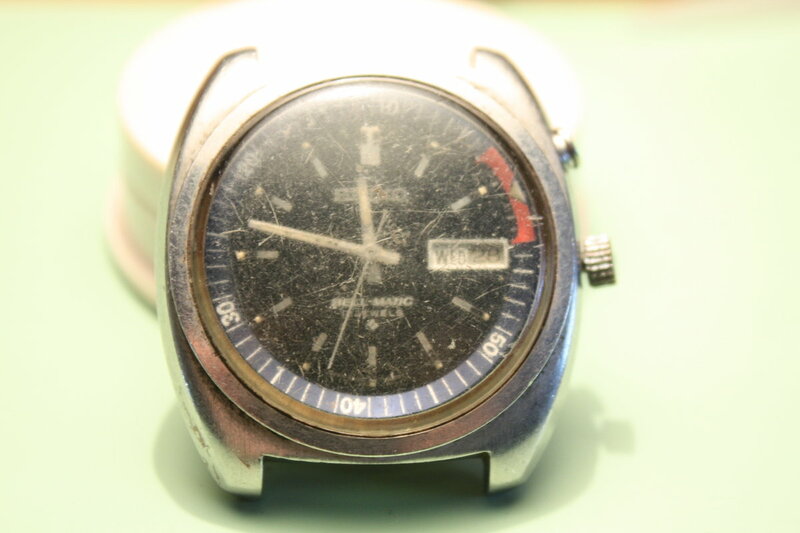 I had exspected to find a perfectly preserved dial under the totally scratched crystal, but what I found was somewhat disappointing: The dial was covered with a thin white film of fungus - something which also happens occasionally with microscope or camera lenses which were kept under (too) high-humidity conditions. 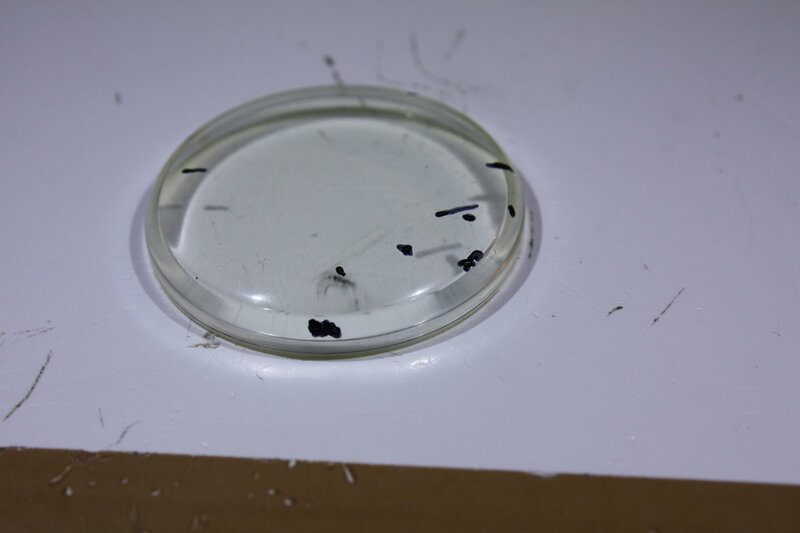 Most of the fungus could be removed with water and an extremely fine diamond paste (0.5.micron grains) which I rubbed over the surface using a water-softened wooden toothpick. 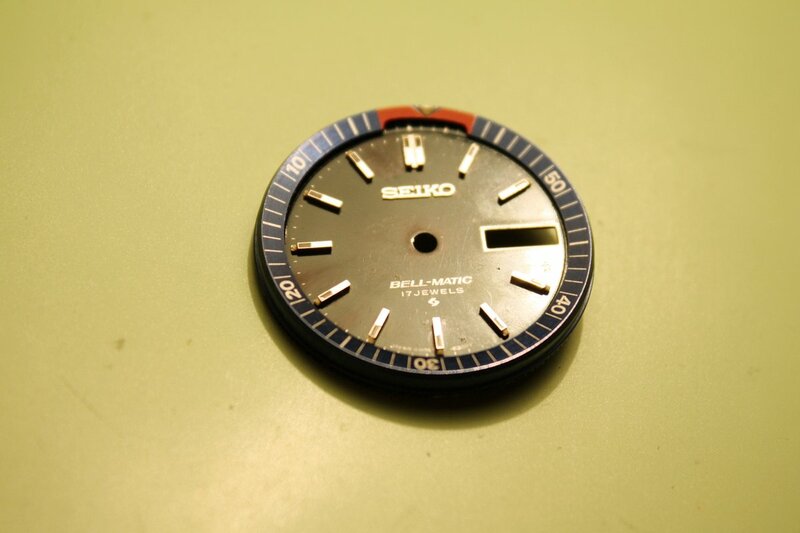 However some spots on the dial have changed there colour due to the chemical reactions caused by the growing fungus. 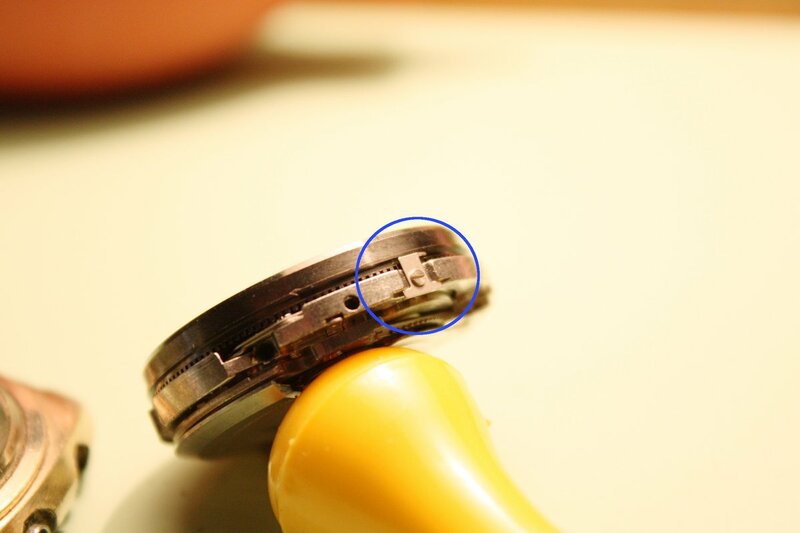 The alarm time indicator ring is held in place by two clips - one can be seen in the blue circle on the next photo. 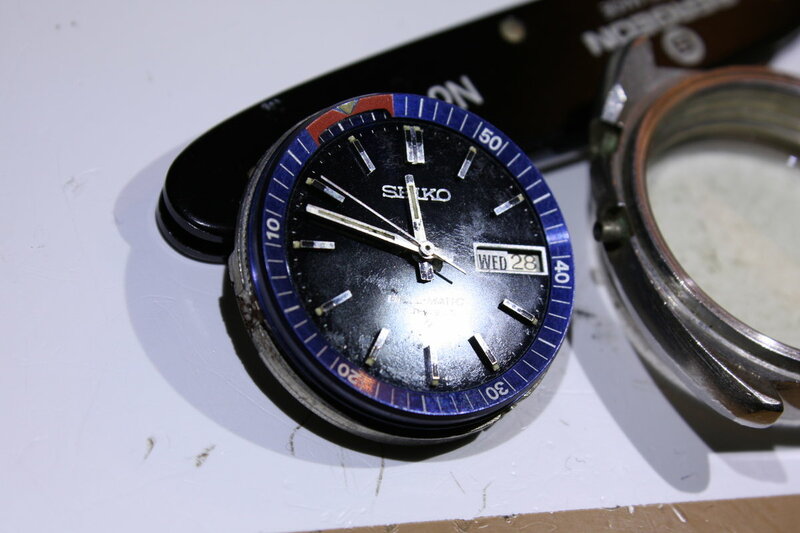 Although the crystal of the blue watch looked terrible, all of the scratches were just superficial. 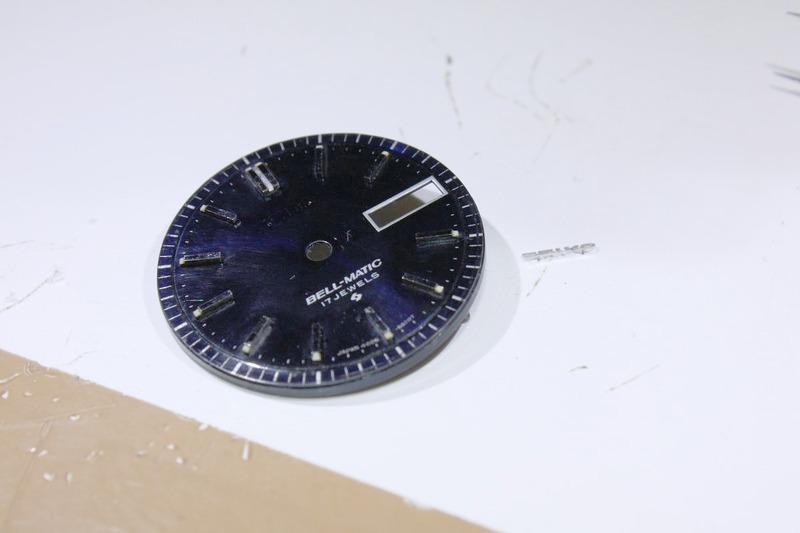 I used a black felt pen to highlight only the deepest scratches and then I started to polish them away with a rough sanding paper. 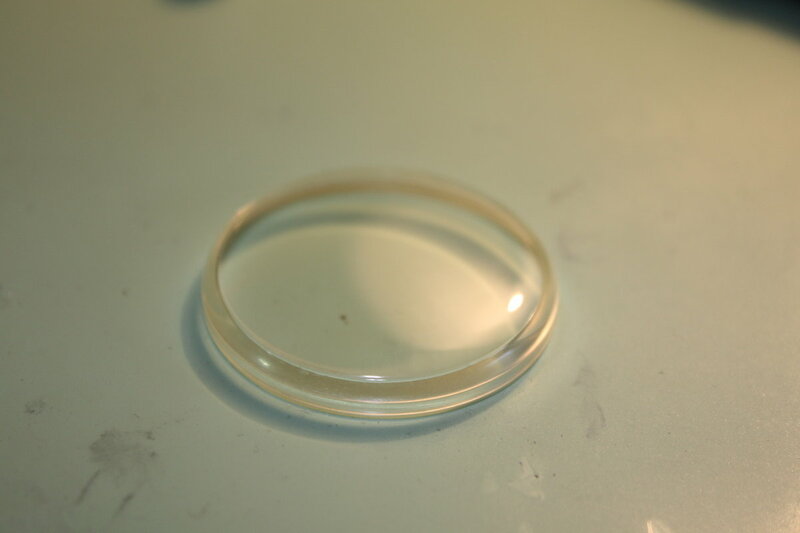 As you can see a concluding application of Polywatch plastic polish brought me back to a almost NOS-looking crystal (this is really the crystal from the first photograph in this blogpost, I swear =-). 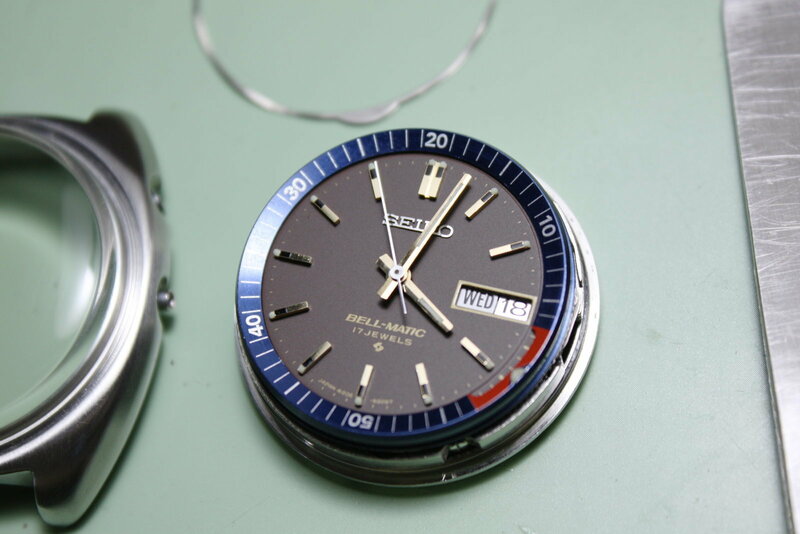 I got the opportunity to try some acrylic coating on the dial of the blue watch (normally intended to be used as a high quality car polish). 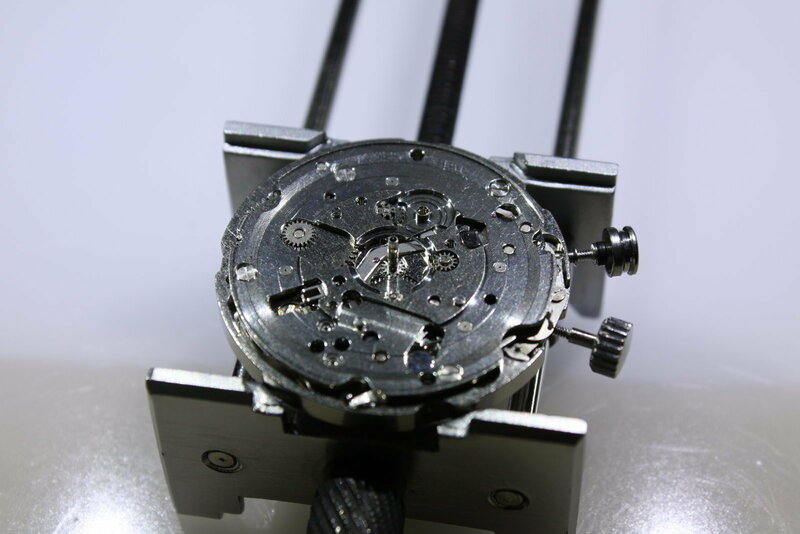 It delivered a fantastic result with a dial shining as bright as a new one (the background was somewhat to bright in this picture...). 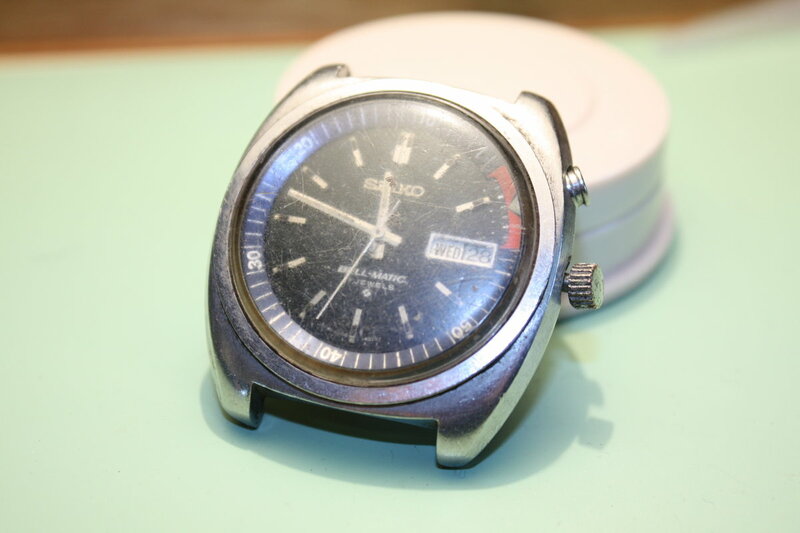 The "Seiko" label lying on the right did not fall off by the way - I had to remove it to get a uniform application of the coating. 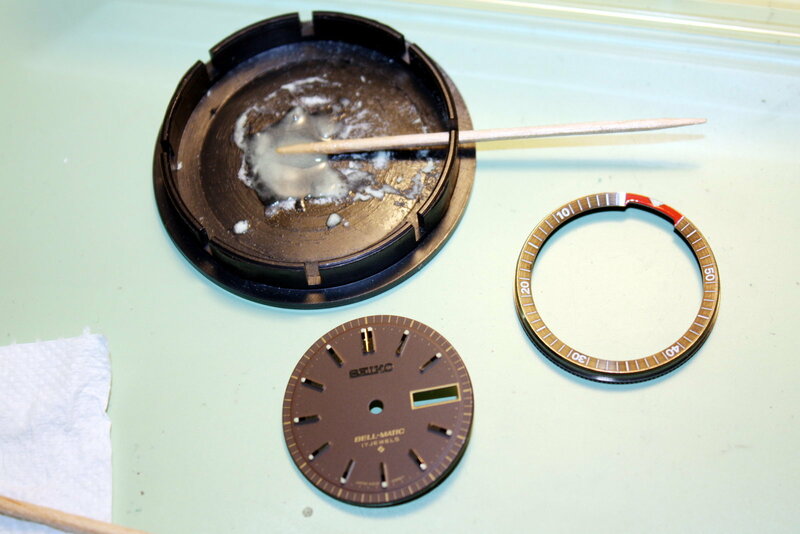 Here the dial gets new luminous markers. 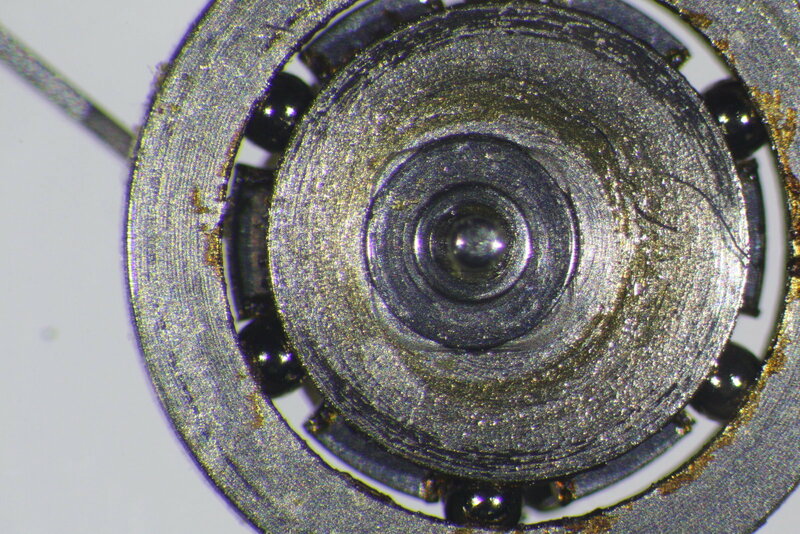 Hour wheel and cannon pinion removed. 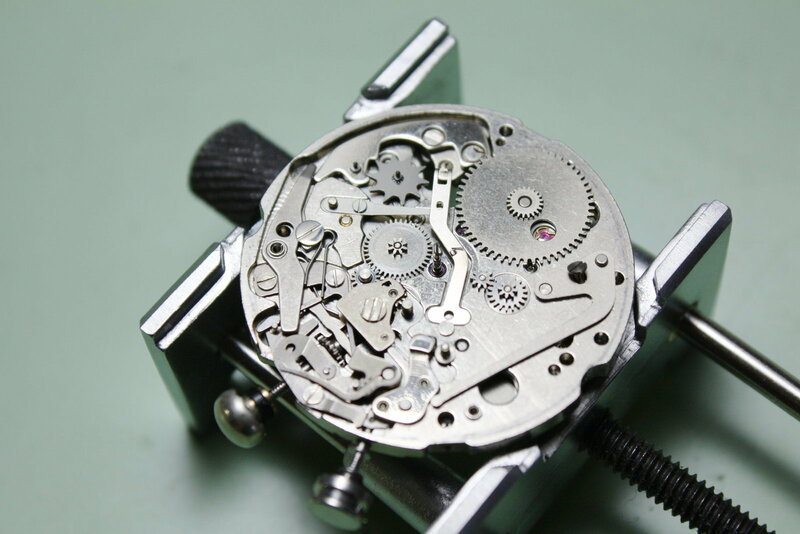 What a complex beast...upper left side: The alarm hammer and the mechanism which drives it. 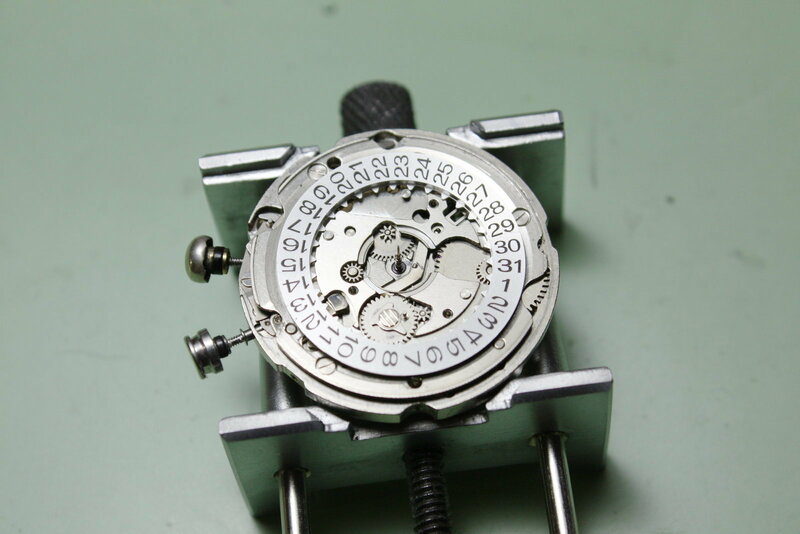 Disassembly continues...(I think I´ll let the next photos uncommented, there are just to many parts involved here). 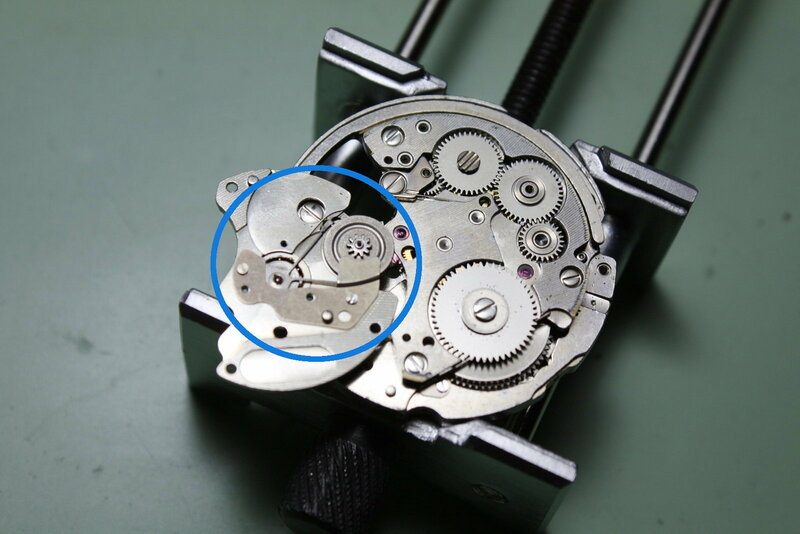 Above and encircled in blue: Seiko´s great "Magic Lever" two-directional winding mechanism -> minimal parts-use = elegant and effective (at the cost of manual winding which is impossible). 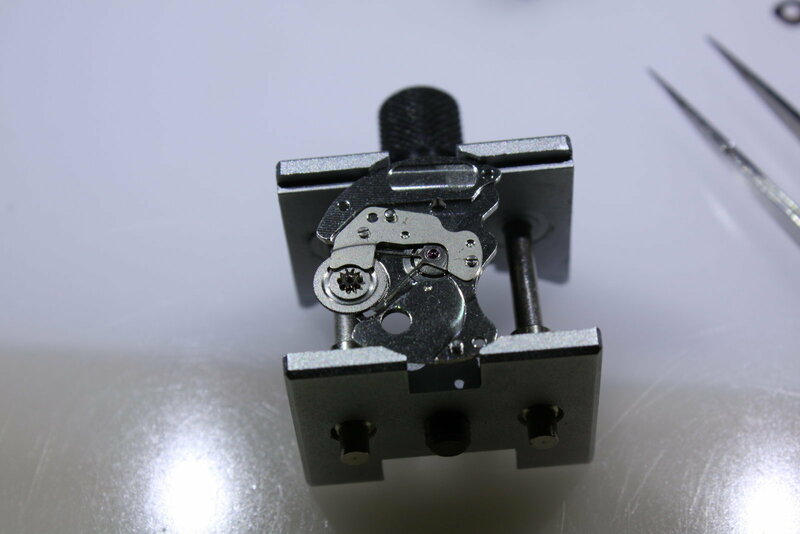 Getting closer to the baseplate. 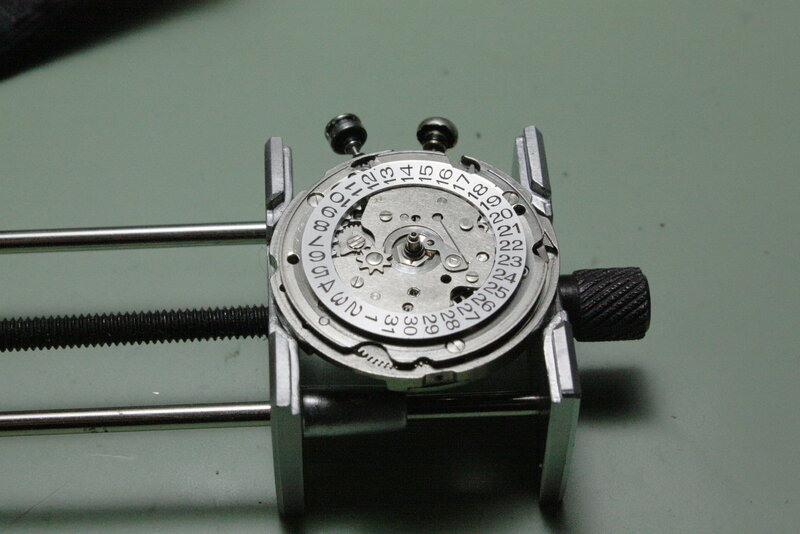 This is a two-spring watch, the mainspring above and the alarm spring below (it does not have a barrel btw). 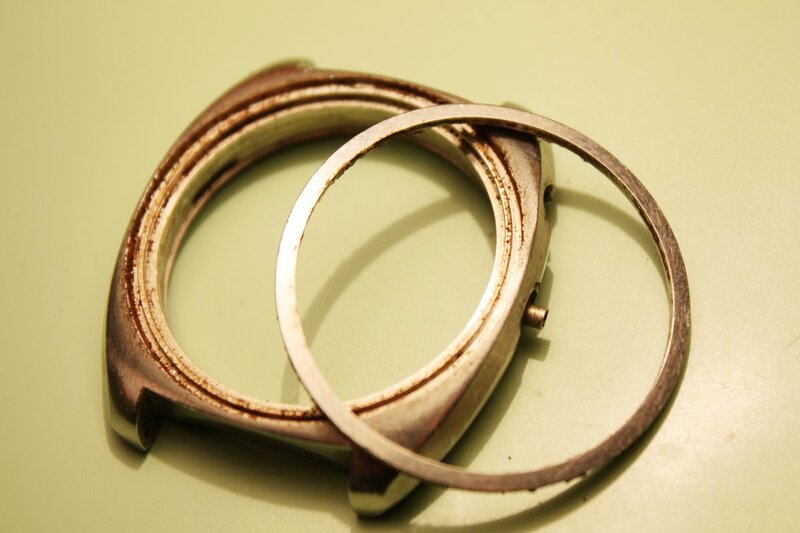 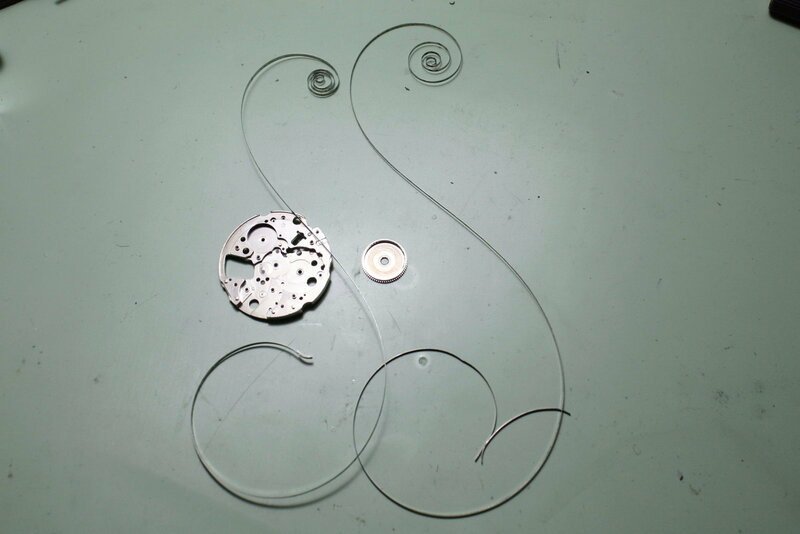 The alarm spring to the left, the mainspring to the right (the latter one is a sliding spring and therefore formed differently to allow for continuous automatic winding). 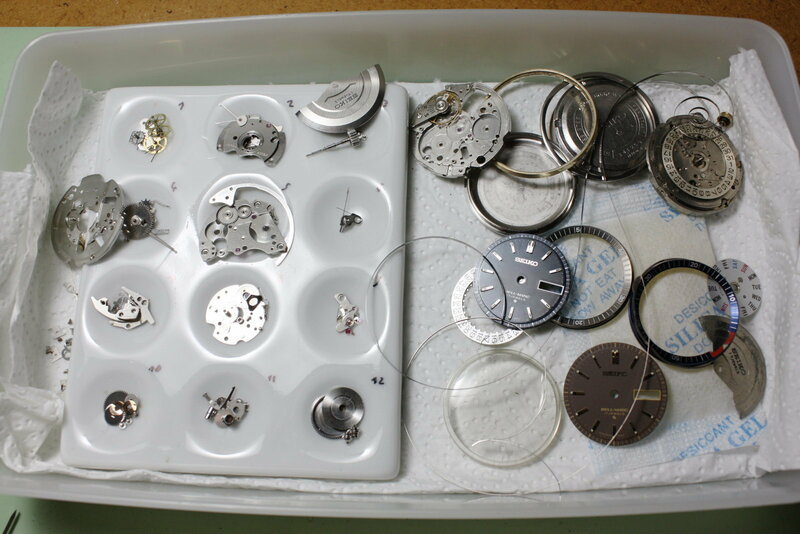 The movement parts before cleaning. 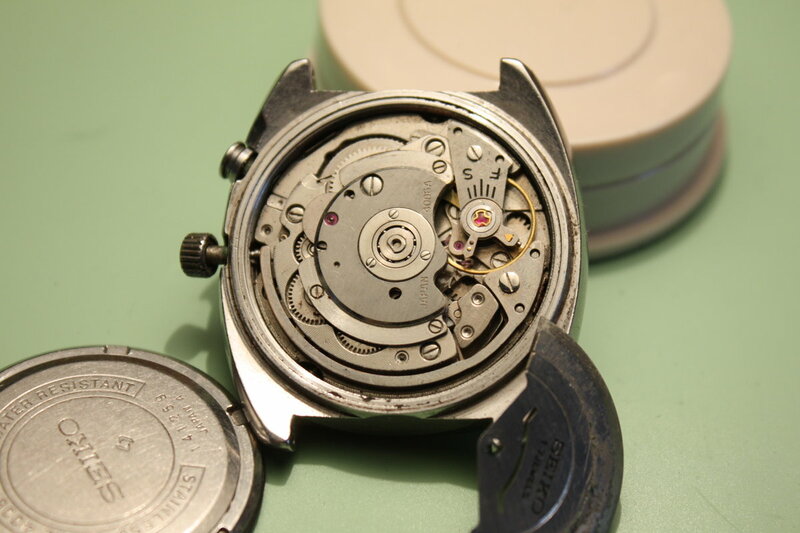 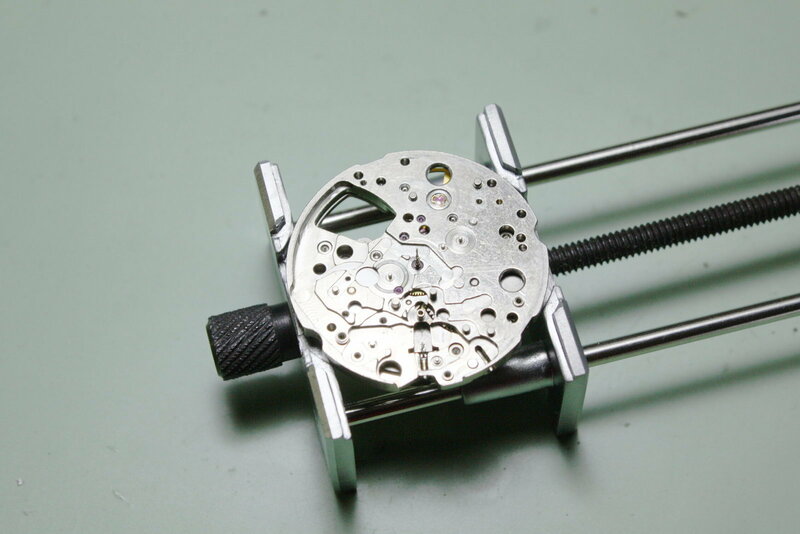 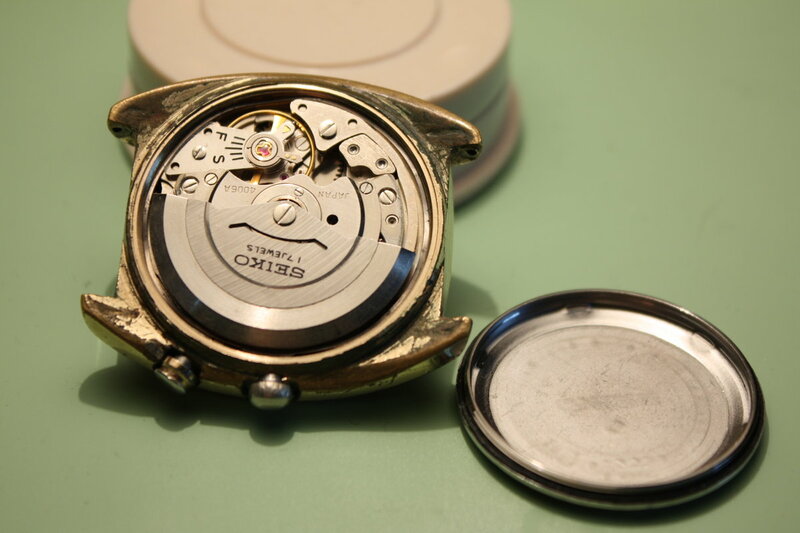 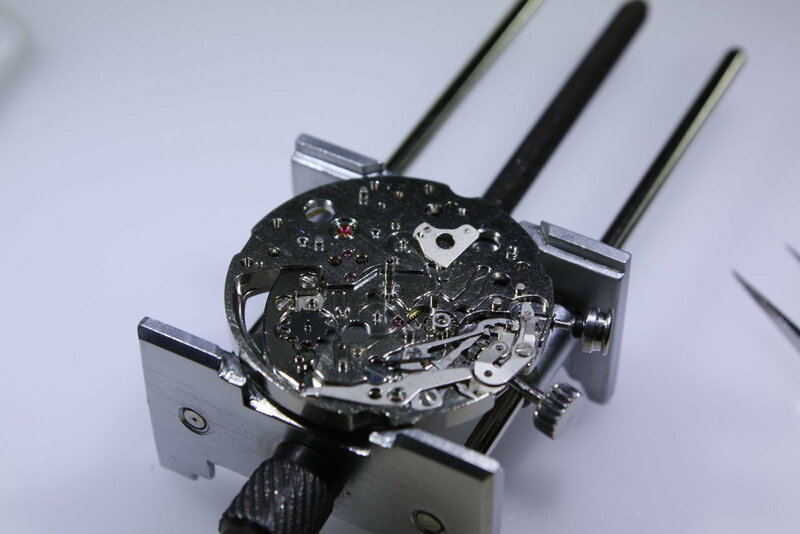 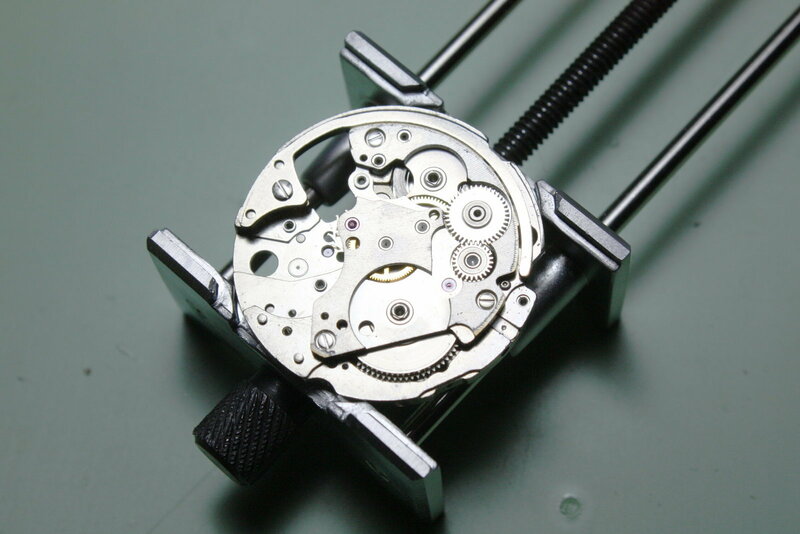 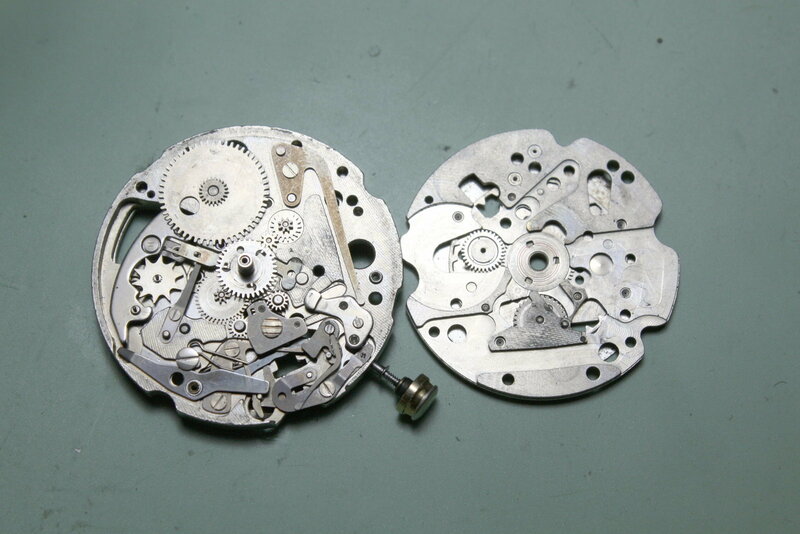 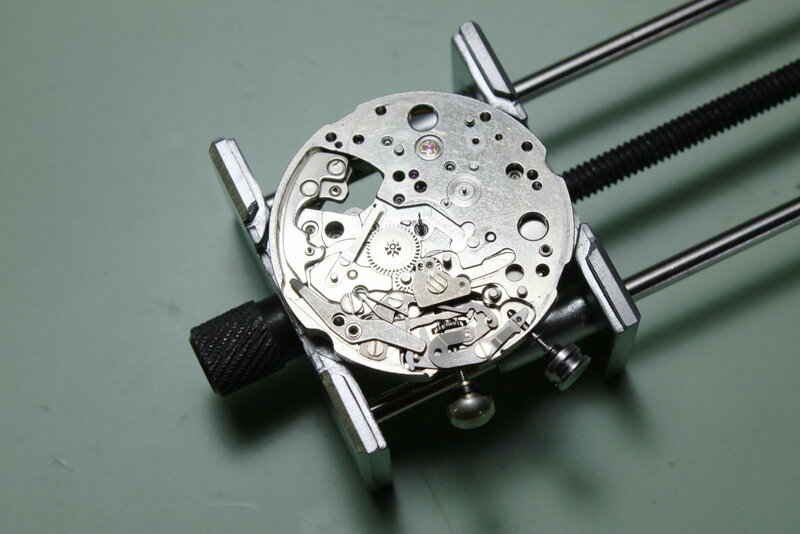 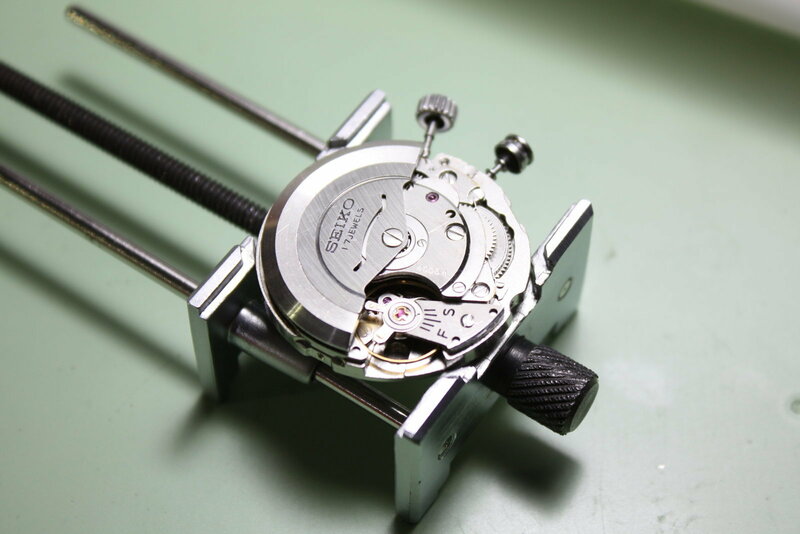 Again, a look inside this complex movement (shot taken from the second 4006A movement). 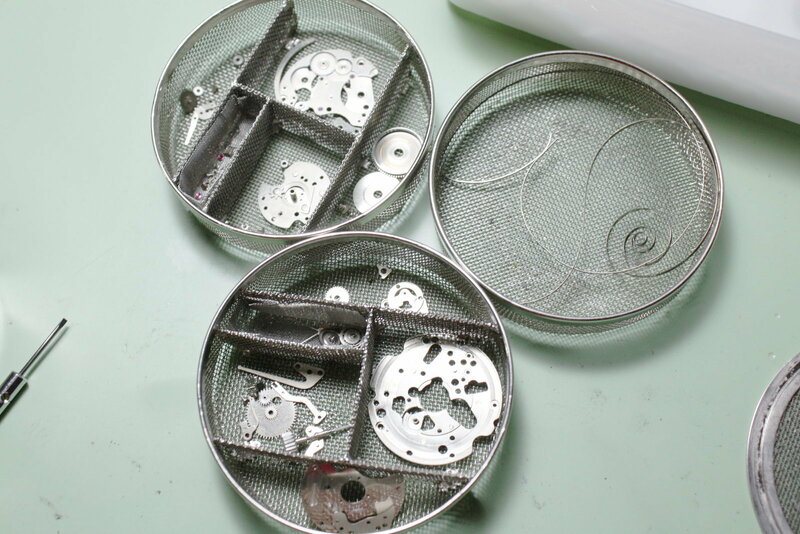 Wheel train and winding parts re-installed. 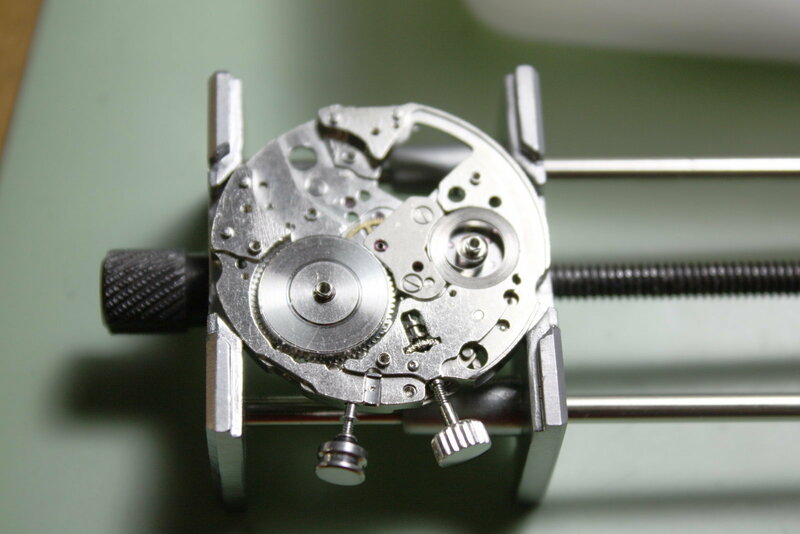 First movement test on the timegrapher - decent...but the dial side is still waiting to be reassembled. 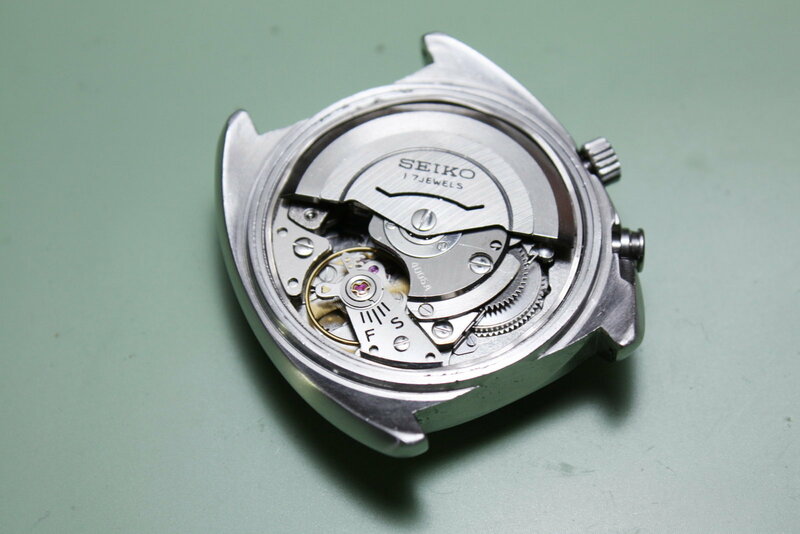 The movement really looks - and works by the way - as it was new. 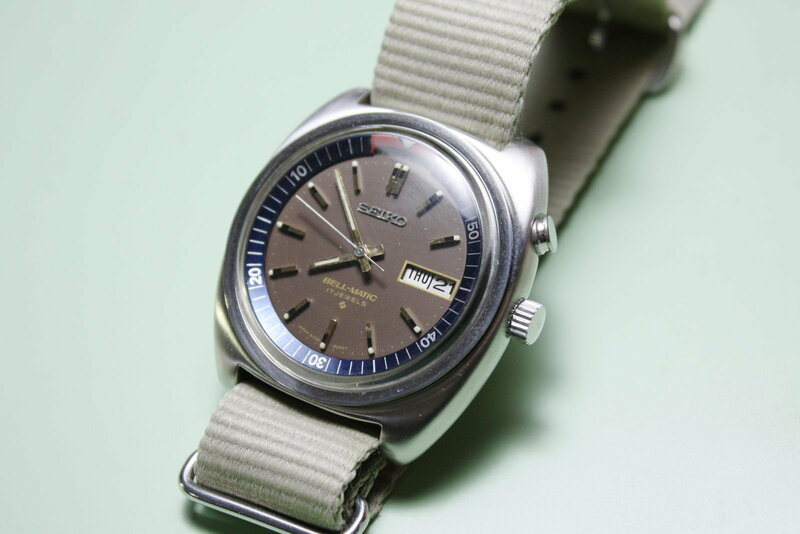 I can´t help, but I think it really looks cool with the brown dial and the blue-red alarm bezel around it (I also salvaged the silver second hand and Seiko logo to contrast them against the golden hour markers and minute/hour hands). 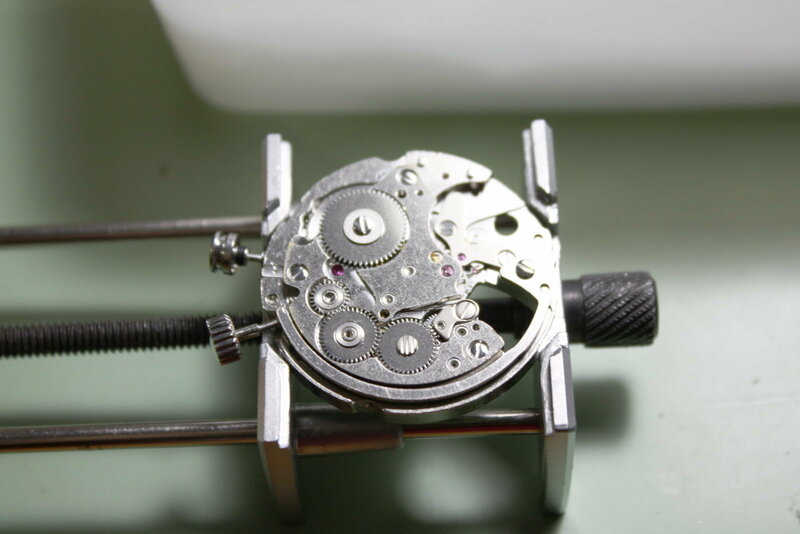 Back in the polished case (I later replaced the somewhat too big with a better-fitting, smaller crown, just in case you noticed the small gap). 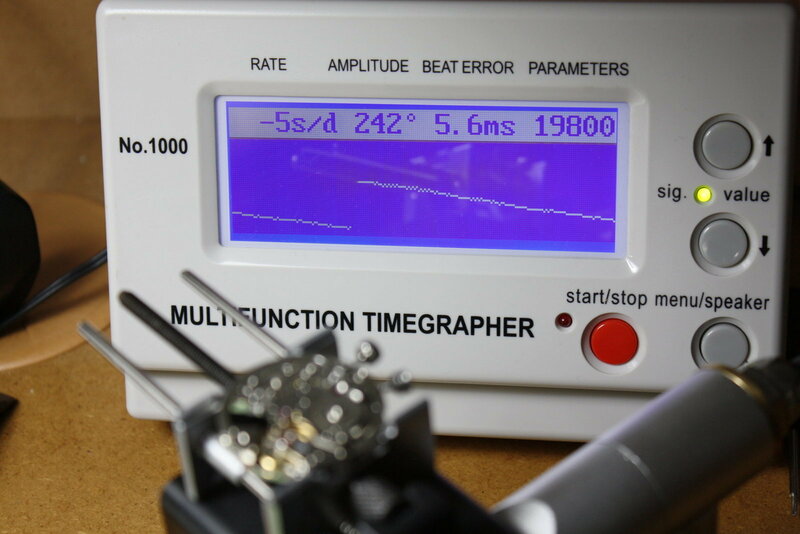 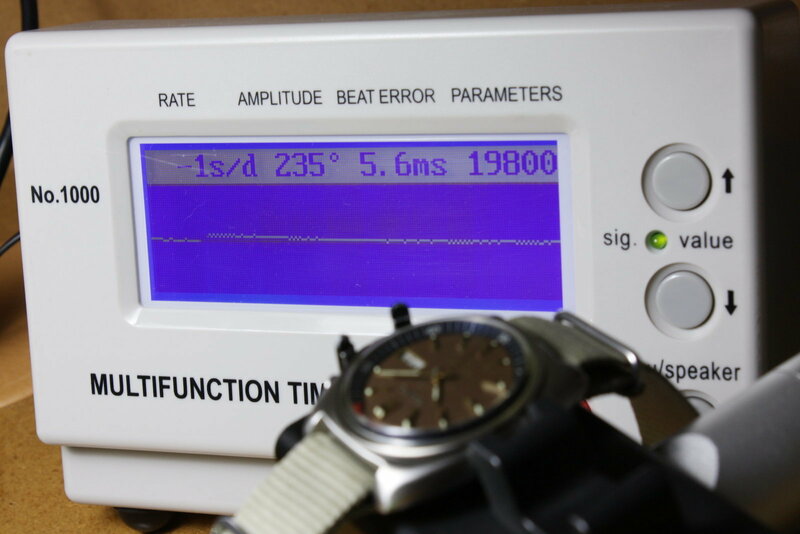 Great result on the timegrapher after regulation - the somewhat low amplitude is normal for older Seiko calibers and results also from the default 52 ° lift angle that is pre-programmed in the timegrapher (just fyi: The 4006A should have 58.4 ° !-). 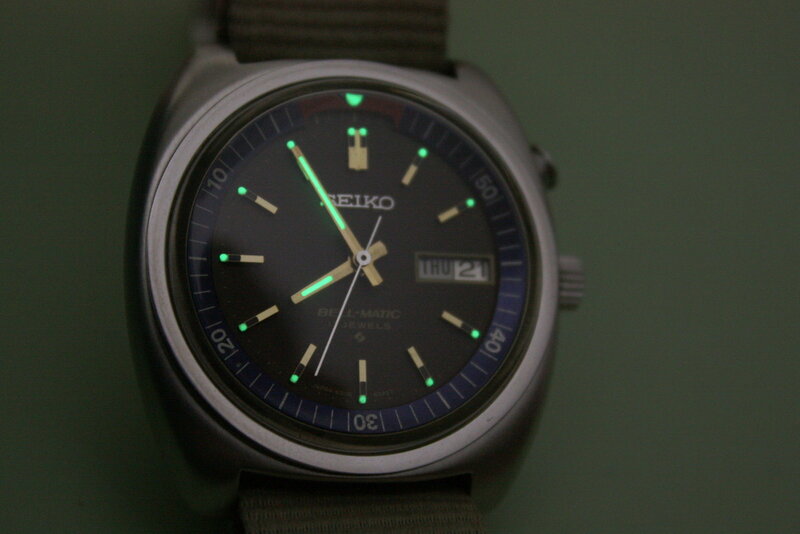 I want to close with a "nightshot".